I have another guest blogger today and it is none other than my own mother, talking about essential oils for chakra balance. Her list of essential oils for chakra healing are in the article below. Chakras are the energy centers within the body through which energy flows. Different chakras are tied to various emotional states and physical parts of the body and when a chakra becomes blocked our unbalanced, physical symptoms can manifest in areas which are tied to that chakra. In today’s world, it’s easy to see the many threats to our health, including chronic high stress, poor diets, exposure to toxins, and emotional dysfunction. And when it comes to our overall sense of wellness, many of us feel overwhelmed and even out of balance. In many of the traditional healing systems of Eastern medicine, this “imbalance” is described using chakras. What are Chakras? In the ancient, thousands of years old tantric and yogic traditions of Hinduism and Buddhism, chakras (which is a Sanskrit word meaning “wheel” or “vortex”) are energy points or channels that give life and vitality. When one of these chakras becomes blocked, there is an imbalance of energy that results in illness and poor health physically and mentally. There are numerous ways to counter the imbalance that can occur in our bodies’ chakras. These include massage, reflection, crystal healing and meditation. But another often-overlooked therapy to enhance the body’s chakra state is the use of essential oils for chakra healing and balance. Essential oils are the life-enhancing “essence” of plants, shrubs, flowers, trees, roots and seeds and are 1,000 times more potent than herbs. Essential oils have been revered for centuries in traditional medicine for their healing properties to the body, mind and spirit – including chakra balance and healing. Just as important is that the numerous contemporary scientific studies now confirm that traditional be benefits of essential oils. Before I go any further, I have to emphasize that not all essential oils are created equal. Ninety-eight percent of all essential oils are produced for taste and smell purposes only. This is your cosmetic grade oils, oils that are put in a lotions, perfumes, soaps, the oils that are readily available at your local health food store, drug store, etc. These are diluted and frankly, they simply do not work and are sometimes toxic, doing more harm than good. To get the best results use therapeutic grade essential oils and use the highest quality oil possible. 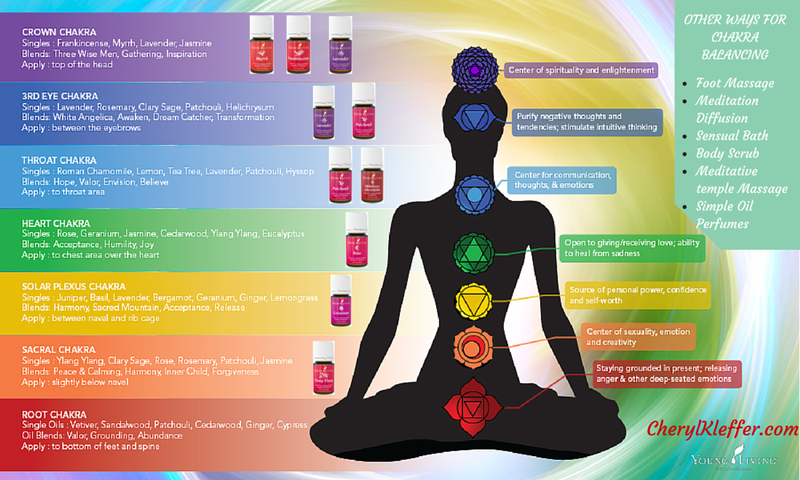 Which Essential Oils Are Best For Chakra Healing and Balance? There are singles – oils made from a single substance – and blends that contain a blend of multiple singles as well as oils that are synergistic for chakra healing, making even more of an impact. Apply to the bottom of the feet and the spine. Apply between the navel and the rib cage. Apply to chest area over the heart. Apply on the top of the head. If you have question about essential oils for chakras such as oil quality, references, blends or just simply how to get started shoot me an email to or visit my website. Click the image below for a full size view.